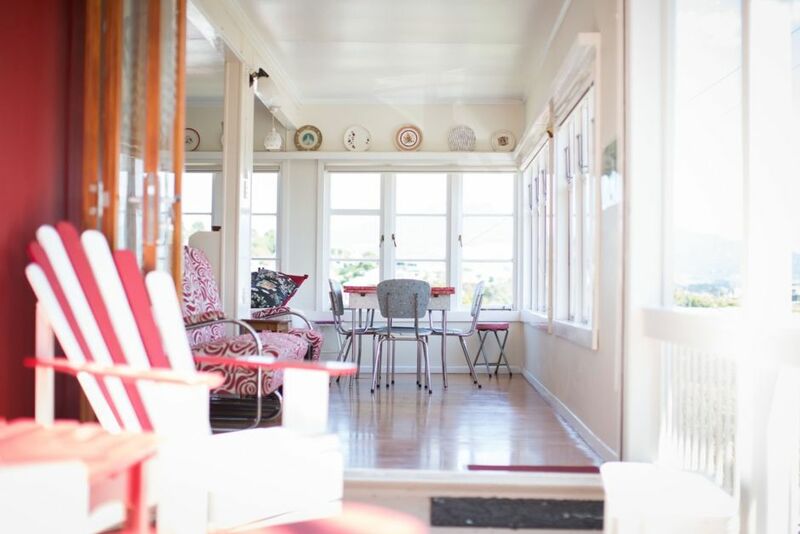 This great property, overlooking Raglan's Whaingaroa Harbour and Recreational Grounds, is perfect for somewhere to enjoy the wonderful feel and unique vibe of this character filled beach-house. Just a short walk to the charming seaside village, where you'll find great funky boutiques, surf shops, fabulous restaurants and cafes, or check out the fantastic galleries and the new museum. Meander down the hill, to the fabulous 'new' wharf complex, with the stunning pottery studio and retail outlet of Tony Sly, plus 'Fish at the Wharf' for all your fresh and smoked fish, or fish and chip takeaways. There's a regular street market the second Sunday of every month, (at the 'Old School' on Gilmour St.) where you can find a treasure or two, buy exciting food and organic produce. But if shopping palls, take in a swim, go kayaking, paddle boarding, or drive to the famous surf beaches, only 10 minutes to the west. This funky bach is currently being restored back to its former glory, retaining the original retro character that has been enjoyed by generations of Kiwi families. The large area downstairs is ideal for the kids to hang out but be aware that there is no internal access to this room. Rates are for 2x Adults - $25 per extra adult per night. Minimum night stay is two nights - except minimum 3 night stay on long weekends. Ask about special long stay rates. An interesting place to stay! An interesting place to stay! This was like the seaside holidays of old! Amazing location with a gorgeous view overlooking the harbour - a two min drive or easy 10 min walk to town. Had everything we needed, comfortably slept 7 adults with a big living area, kitchen and bathrooms were great. Interior was quite dated and needed a good clean - some retro elements were awesome but we were disappointed to discover some racist items proudly on display including golliwogs and other ethnic ornaments - we would not have booked if we had known. Views are great from the bach & it's charm lies in it's quirkiness and collections - has a few cobwebs in places though - generally clean otherwise . Really cool place, lovely views and had everything we needed. Really cool place, lovely views and had everything we needed. Living room was set out really well and location was amazing.